A museum visitor who said he had accidentally smashed three 17th Century porcelain vases has been arrested on suspicion of causing criminal damage. Nick Flynn said he had tripped over a shoelace and crashed into the Qing Dynasty vases at The Fitzwilliam Museum in Cambridge in January. A specialist restorer is gluing together more than 400 pieces to recreate the highly valuable artefacts. Mr Flynn, 42, was arrested at his home in Fowlmere, Cambridgeshire. A Cambridgeshire police spokesman said: "A 42-year-old man has been arrested on suspicion of criminal damage in connection with an incident at The Fitzwilliam Museum in Cambridge on 25 January." The three damaged vases were among the best-known artefacts at the Fitzwilliam Museum where they had stood on a recessed windowsill since 1948. Two were smashed into pieces and a third suffered serious damage when they fell to the ground, and many shards of porcelain became mingled together. 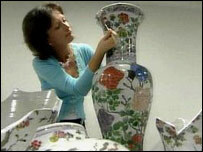 Conservation experts are documenting each piece in an effort to put the vases back together as they were. But they said the cracks would still show. The three vases are from a collection of five which the museum said could be worth up to £300,000.